A new urban middle class developed in industrial cities toward the end of the Nineteenth Century and in the early Twentieth Century. For the first time, numerous men held white-collar jobs in industries, the retail trade and banking. Many of these men joined fraternal orders. For some decades these fraternal orders prospered. In 1870, a fraternal organization known as the Ancient Arabic Order of the Nobles of the Mystic Shrine was established in New York City. This was intended to be an organization for Masons who were interested in fellowship and fun. I presume that it was founded by Mason who wanted to participate in a linked but somewhat different organization that was more oriented to enjoyment rather than semi-religious activities. 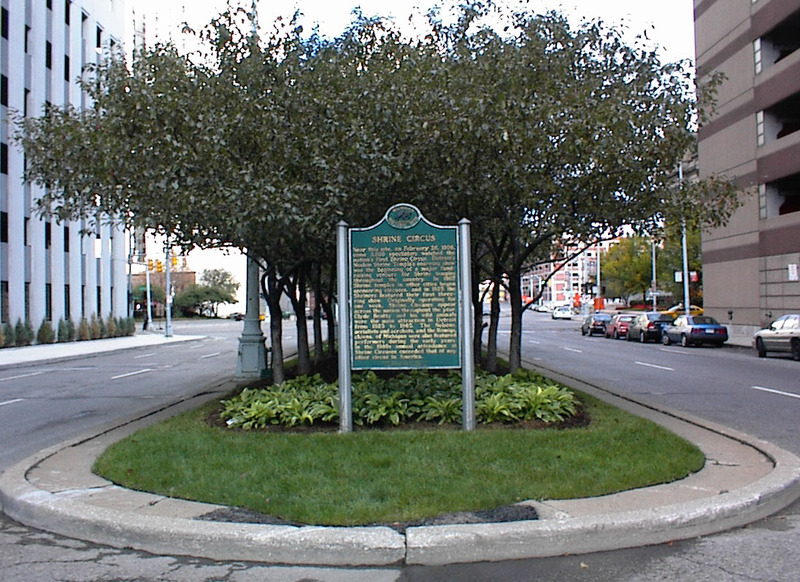 Later in the Nineteenth Century, a Shrine chapter was established In Detroit. Quickly their members became known as Shriners and that name has taken hold. The Shriners were one of the most popular and financially successful of these fraternal groups. The huge Masonic Hall that faces Cass Park testifies to the resources that the Shriners once had in Detroit. 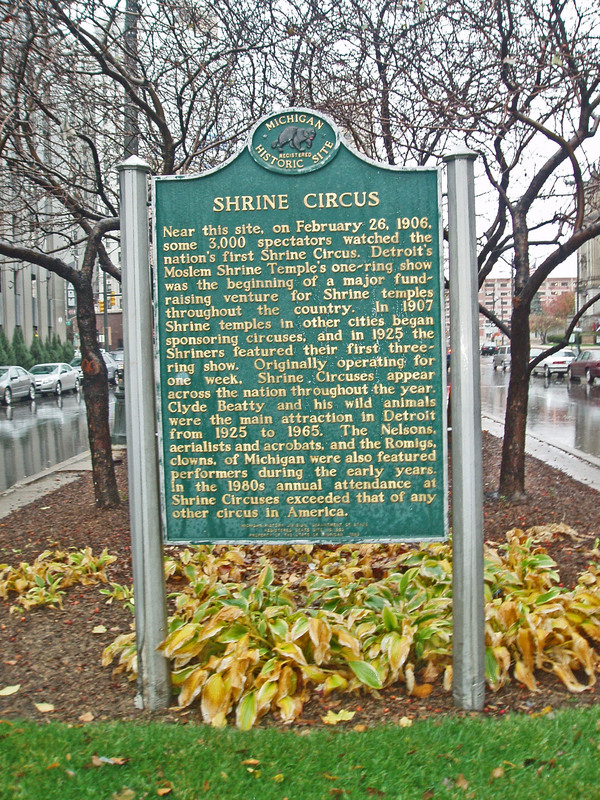 To raise funds for their organization, Shrine members in Detroit developed the idea of organizing a circus that would play at indoor venues during the winter. The Shriners would recruit the acts, rent the hall and share in the receipts. The idea of sponsoring such a circus began in Detroit. In December of 1905, William A. Baier and Russell G. Pearce of Detroit’s Moslem Shrine Center started recruiting acts. The first performances of this Shrine sponsored circus were then held in February, 1906. This endeavor was successful in raising funds so sponsoring a circus was repeated in Detroit. Gradually, the idea spread to other chapters. Eventually, the Shriners developed a group that organized a circus that traveled from city to city, playing in indoor arenas. A share of the revenue was devoted to the children’s hospitals that the Shrine organization continues to support. The Shrine Circus continues to operate. I believe the home office is located in Clio, Michigan. Typically, the circus begins their season with performances in Flint, Port Huron or another Michigan city in February and concludes their season with a series of shows in New Orleans in November. The Shriners successfully established 20 hospitals in the United States and one each in Canada and Mexico. They were designed to provide free treatment for polio to children under age 18. After Dr. Salk’s vaccine greatly reduced and then eliminated polio, the hospitals were devoted to other children’s health issues. While fraternal organizations declined in popularity, it appeared—for some time—that the 22 Shrine hospitals would continue to offer services since the Shriners had very effective fund raising techniques—including their circus. The hospitals appeared to be very well endowed, but the value of their invested assets was reduced by 50 percent in the economic crisis that began in 2008, so there may be some changes in the future for these hospitals. Increases in the hours that professional men work and important changes in the role that husbands and fathers play in families have greatly reduced the appeal of fraternal organizations. In 2010, the Ancient Arabic Order of the Nobles of the Mystic Shrine officially changed their organization’s name to Shriners North America. Near this location on February 26, 1906, spectators watched the first Shrine Circus. In subsequent decades, Shrine Circuses across the nation raised funds for charities.